The unique experience of vacationing above the waves in a luxury overwater villa no longer requires a trip halfway around the world to Tahiti or the Maldives. 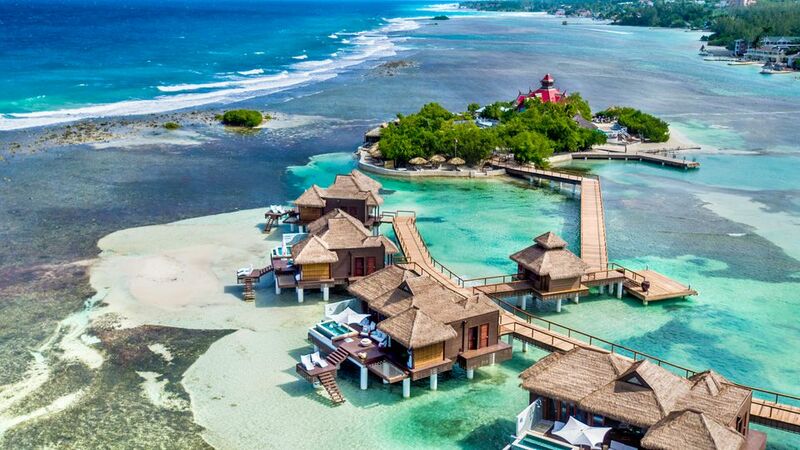 The overwater villas at the Sandals Royal Caribbean resort in Montego Bay, Jamaica are the first of their kind in the islands of the Caribbean. Overwater villa guests are greeted by their personal butler upon arrival at the resort, which sits on Mahee Bay less than 10 minutes by car from the Montego Bay airport. After a brief private check-in, guests are escorted aboard an electric-powered Duffy boat for the short cruise to the villa dock. Access to the villas is by boat only: each overwater accommodation is attached to a lollypop-shaped boardwalk extending west from the resort's private island, Sandals Cay. Your butler can assure that the boat will be waiting for you whenever you need to get back and forth, but the service is generally prompt even if you up on the dock unannounced. The five overwater villas at Sandals Royal Caribbean opened in December 2016 and are sold out more than a year in advance. However, Sandals also is building an additional 12 bungalows at the resort, and has plans to build more overwater villas at three other Sandals resorts in Jamaica (including the Sandals Whitehouse/South Coast and the Sandals Royal Plantation) and at the Sandals Grande St. Lucian in St. Lucia. The Sandals overwater villas have about 2,000 square feet of indoor/outdoor living space, including a combined bedroom/living room, spacious master bath, a small kitchen area, and large outdoor decks screened from prying eyes and facing the Caribbean. The overwater bungalows are smaller and have most bed and bath amenities in one shared space. All of the overwater villas face the ocean, while some of the bungalows have views back toward land. King-sized teak beds dressed in Egyptian linens face oversized sliding doors that can be opened wide to create a virtual air wall, allowing the ocean breezes and sunlight to filter into the bedroom. At the foot of the bed is a glass floor with views of the sand and sea life below the villa, which stands on tall, hurricane-proof footings high above the gentle waves. A pair of comfy armchairs also look out to sea, a relaxing spot to catch up on reading or even catch a nap. The villa bathrooms are nearly as large as the bedrooms, designed for comfort as well as convenience. Couples -- and the 227-room Royal Caribbean is a couples-only resort -- will delight in a soothing bath drawn nightly by their butler in a deep soaking tub, while separate his-and-hers vanities make it easy to freshen up in the morning or get ready for a night out on the town. Molton Brown bath amenities add a touch of luxury to a rainfall shower in a spacious tiled stall, which connects directly to the dual shower space outside. A separate water closet has a toilet and bidet, and the walk-in closet has more than enough space for all of your clothing and shoes: your butler will even unpack for you, and press your wrinkly clothes upon arrival. A Heck of a Deck! You'll want to slide those big bedroom doors closed at night to keep the mosquitoes out, but other than for sleeping you'll likely spend most of your time in your overwater villa outside on the tiered deck, which is filled with relaxation spaces. Cushioned chairs are arrayed around a stone table topped with a whimsical tick-tac-toe board, while a suspended couch tossed with pillows invites you for an afternoon nap in the shade. For sunning, the prime spot is on a rope hammock swaying gently above the water. Showers for two provide a prelude to romance or just a quick cool-down from the hot Jamaican sun. Couples can comfortably share the infinity-edge plunge pool overlooking the ocean. If you wish, you can take advantage of the 24/7 butler-delivered room service and enjoy breakfast each morning outside under the morning sun. You'll love the water-filled lounge chairs on the villa's lower deck, where you can really feel a sense of isolation from the rest of the resort and indulge in the sense of being one with the sea. For tanning, reading, or enjoying a fruity cocktail, this spot is tops. Just be mindful of mixing too much sun and rum: it would be all too easy to take a bad step off of the villa decks, which don't have railings of any sort. The water below the villas is quite calm but shallow, as you'll see when you take the stairs from the lower deck right down into the waves for a walk on the sandbar or a swim or snorkel off Sandals Cay (which also happens to have the resort's clothing-optional beach -- you've been warned!). The butler service at Sandals is a team effort, and it's a much-appreciated adjunct to an overwater villa stay. Given the relative isolation of the villas from the rest of the resort, guests will find themselves being highly reliant on their butlers for everything from coffee in the morning to afternoon cocktails, to room service and dining reservations, to arranging for activities both on and off the resort. The staff is friendly, professional, and eager to please, and by the end of your visit you'll be happy to learn that your butlers (along with spa therapists) may accept gratuities -- an exception to Sandals' general "no tipping" policy. Waking up in the morning to peer over your toes at the Caribbean is a special experience, and the Sandals overwater villas are truly at their best in the early hours of the day as the tide comes in. The afternoon low tide reveals a rocky sandbar that's less visually appealing but is also the best spot for viewing the spectacular sunsets to the west. There are plenty of fun activities at the Sandals Royal Caribbean -- the Red Lane spa treatments, sailing around the bay on a Hobie catamaran, and dinner at the reservations-only Le Jardinier French restaurant are highlights -- but don't be surprised if you're tempted to spend most of your time in and around your villa. Your butler will bring you drinks whenever you ask, and the villa is also well-stocked with premium liquor (notably 12-year-old Appleton's rum) whenever you want to mix your own. The room service menu is extensive, you've got your own pool and snorkel gear, and the ocean is just below your feet. In short, the Sandals overwater villas are built for privacy and romance -- an all-inclusive luxury experience that is unmatched in Jamaica and rivals the kind of honeymoon, destination wedding, or special-occasion trip you could previously only dream about in the Caribbean. There's a price to match, a stay is worth it even if for only a couple of nights as part of a longer visit to the Royal Caribbean -- it's the kind of splurge that will be worth the memories in the years to come.